Chromium OS is a lightweight, lightning-fast operating system for your netbook, laptop or even desktop. With the familiar environment of Chromium/Chrome, the entire web is at your fingertips in seconds. HTML5 & Flash are fully supported, allowing you to enjoy the very best that the web has to offer. Step #1 Download and install image extracting tool on your PC. click here to download the latest version of “WIN32 image writer”. after downloading “WIN32 image writer” unzip it and click on diskimager.exe to install. Update: Direct Downloads are down. You can download Torrent here. 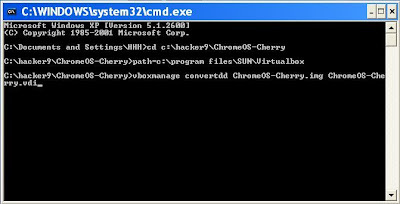 Step #3 After downloading Chrome OS-cherry, extract it using WinRar or 7Zip to a specific folder. after extracting you will see a img file “ChromeOS-Cherry.img”. Step #4 Now Run “WIN32 image writer” and click on Browse to locate the file ‘ChromeOS-Cherry.img’. select the drive as USB device to extract this image file on to your Pen Drive. Step #5 After Extraction is complete the next step is to Restart your PC and select Boot device as your USB drive (press F8 to open Boot Menu on restart). Locating virtual box program: type path=c:\program files\sun\virtualbox\ and press Enter. Converting image file to vdi file: Type vboxmanage convertdd ChromeOs-Cherry.img ChromeOS-Cherry.vdi and press Enter. This will convert the .img file to .vdi file which can be used by Virtual box. -enter any name say ‘Chrome Os’. -click on next and set the memory to 256MB. -next, select “Use existing Hard Drive” and point to the Chrome-OS vdi file that we just created in Step#3 and click finish and launch it.